DigiCrumbs: Layered Watermelon Fruit Cake - First Birthday Cake made of Fresh Fruit! This is one fruit cake everyone will love to eat! Since we had a small family get together on the weekend with a traditional birthday cake and mini smash cake for our one year old. We wanted to have something special for my daughters actual birthday during the week. I decided to make one of the watermelon “cakes” that are popular now. So I came up with an idea for the design and purchased fruit at the grocery store. To my surprise, I cut the fruit and built the cake in way less time than it takes me to make a traditional homemade birthday cake. Here’s how the fruit stacked up. 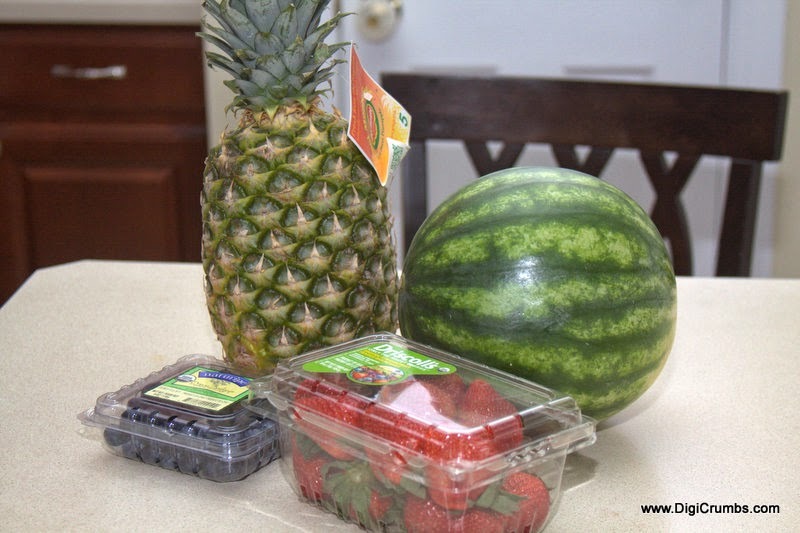 The base is made of a small round seedless watermelon and the top tier is a section of fresh pineapple. I topped it with whole strawberries and decorated with blueberries around each layer. Since my daughter was born in February, I added sweet little pineapple hearts cut out with a mini heart shaped cookie cutter around the watermelon layer that are attached with toothpicks. I decided not to add whipped coconut cream or traditional whipped cream for frosting. I thought the leftover fruit would keep better without it. Since my baby girl is too young to blow out a candle, I made a number 1 pick on the computer that I punched out with my scallop punch and attached to a wooden kabob stick with a glue dot. The long kebab stick went through the layers of fruit on the cake and would help to keep it stable if you were to try to transport it to a different location. I love the way this watermelon fruit cake turned out! In fact, I would be thrilled to have one of these for my birthday. The best part was the birthday girl loved it and thoroughly enjoyed sampling all the different types of fruit on her cake. If there are any leftovers, they’re healthy and pack up nicely for lunches or easy snacking. I wish I would have took a picture of the aftermath of this creation. Lets just say there were watermelon rinds, pineapple pieces and various other chopped fruit scraps scattered across the kitchen island like a real live fruit ninja game. Even so, this birthday fruit cake was totally worth it. Happy 1st Birthday Our Little Sweet!